Tell me, Haley. What in the world is the point of a no-bake pie in November? It's not a million and four degrees outside, so can't you justify turning on the dang oven? Especially for an occasion like Thanksgiving?? I make a good point, don't I? Sometimes, though, I just can't explain my choices in words other than "because it feels right". THAT is justification enough for me! Besides, aren't dessert tables going to be packed with cakes and pies that have taken up plenty of time and space in the oven? And let us not forget the turkey that took five hours, too. Just sayin'. Thinking about Thanksgiving as it approaches in a week, I'm extra thankful this year for, finally, a stress-free mindset like I've never experienced it before. For as far back as four years, some sort of food restriction - be it created by an eating disorder or just a choice of diet - determined what I could and couldn't eat on Thanksgiving. Surrounded by family and friends, I wanted in my heart nothing more than to break those restrictions and graciously accept a slice of Grandma's homemade pie, compliment the host on her turkey cooking skills and sweet cranberry sauce. Aside from the food, I wanted so bad to feel thankful for the body size/shape God wanted for me. Let me tell you - few battles are more exhausting than that against God in trying to control one's physicality. Four years, I fought determined to create what I now realize is an unattainable sort of "balance" between exercise and what I thought of as life. When fighting battles, big or small, can one even be thankful? I mean, essentially, the battle itself is a means of achieving some sort of desired prize or goal, right? To begin a battle requires a feeling of inadequacy regarding one's current circumstances and a consequent sense of longing for some prize/goal that seemingly can improve circumstances. Do you see my point here? Gratitude for something not good enough sounds non-existent. It just doesn't make sense. And now I sit here and question the legitimacy of my thankfulness for the last four years of my life. Deep stuff. BUT happy stuff - I sit here and fill that little hole that just formed with gratitude for my gratitude (yes, stay with me) for accepting and embracing God's design for me. After alllllllll this time. Sigh. We can lose a lot of energy worrying about perishables when we don't recognize, care for, and express gratitude for our cherish-ables. See what I did there? "Cherishables" being family, friends, a functioning, breathing body, food on the table, and the list goes on. Perishables being an unattainable or unsustainable size, social media posts, temporary stresses, etc. You don't win battles by waiting for your soldiers to gain muscle and skill. You win battles by strengthening and practicing. You don't conquer food fears by trying to fill your stomach with carrots to avoid feeling hungry for the cheese and crackers you really want. You conquer food fears by eating the cheese and crackers and feeling power over them. 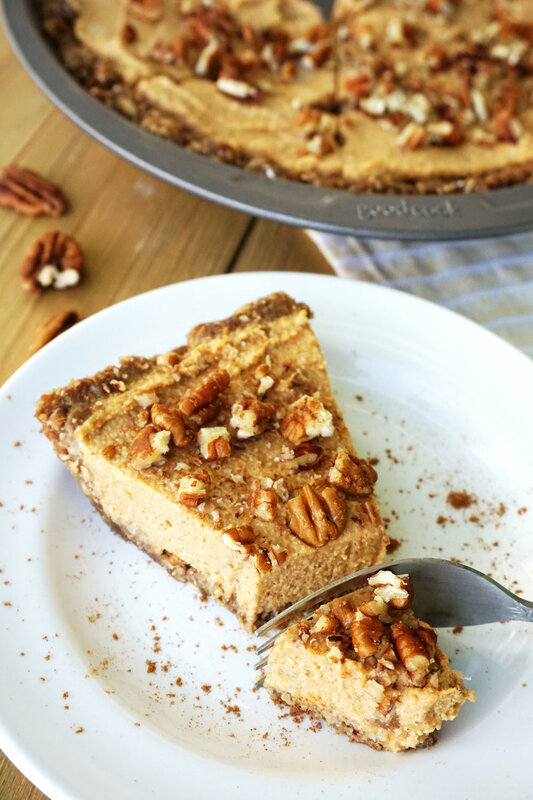 This pie - vegan, refined-sugar-free, paleo - might not serve as the best example for a way to conquer food fears. Oops. But, like I said before, sometimes I make decisions solely because "I feel like it". I wanted to mess around with a date-sweetened dessert than doesn't so, and I also wanted to make a pie. Aaaaaand I don't feel quite equipped yet to make my own pie crust. In fact, I tried doing so two weeks ago. Some of my Health Educator teammates and I bonded over Costco pizza while we creamed together butter, sweet potato, sugar, maple syrup, and eggs and prepped an old-fashioned graham cracker crust. I burnt it. But I gave myself some grace because it was only my second homemade pie ever. A week later, I tried again on my own. Burnt it again. Taking those two consecutive mistakes as signs, I decided to keep the oven off for this recipe. 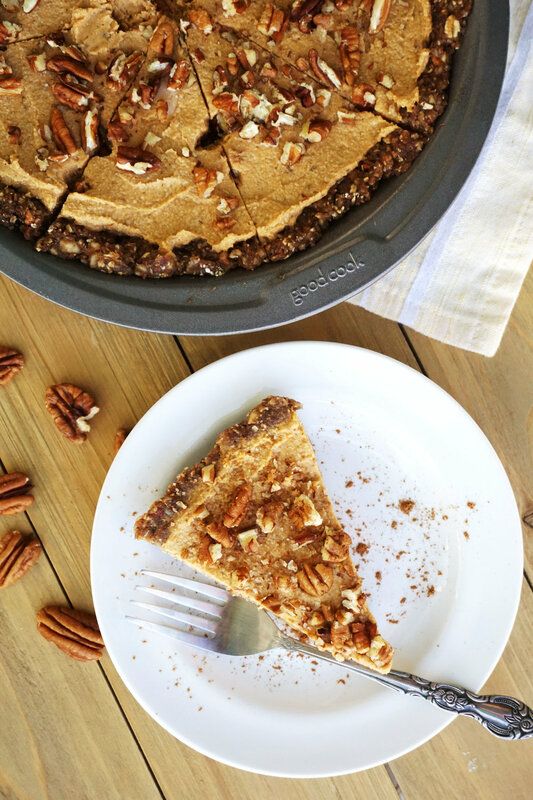 Begin making the crust by pulsing the almonds, pecans, and sea salt in a food processor. Drain the dates and add to the food processor with the nut/seed butter of choice and pulse until nuts and dates are finely chopped - you don't want any big chunks. Press the crust into a pie pan, filling the area of bottom first and then lining the sides as much as possible in an even layer. Refrigerate. Prepare the filling by draining the dates and cashews and tossing them into the food processor with the sweet potato and coconut milk. Pulse until smooth - now you really don't want any chunks. Add the vanilla and spices and pulse again to combine. Pour the filling on top of the crust and use a spatula or knife to smooth. Sprinkle with sea salt and crushed pecan pieces. Freeze for 6-8 hours before slicing. Serve immediately and store leftovers in an airtight container in the freezer.